"I've Seen the Highs and the Lows" | 2012 Power List | Style Weekly - Richmond, VA local news, arts, and events. 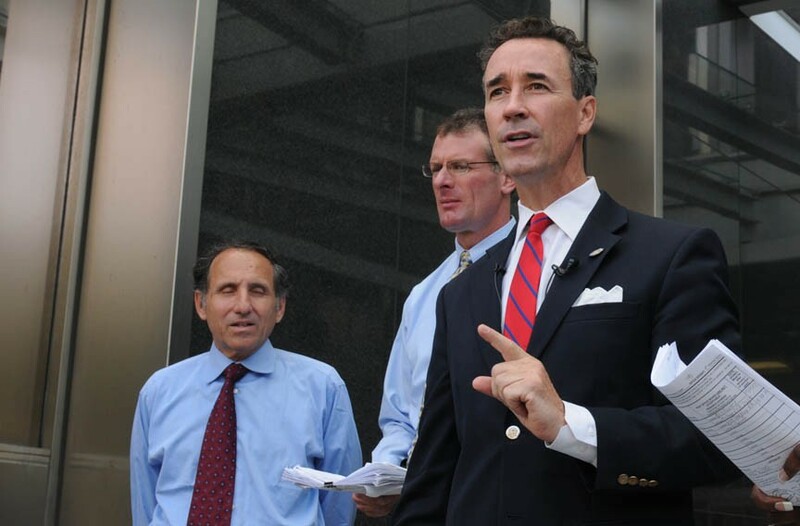 Delegate Joe Morrissey (right) with disqualified mayoral candidate Michael Ryan and law partner Paul Goldman outside of City Hall last month. Joe Morrissey has walked the halls of power in and around Richmond for more than two decades. He's been commonwealth's attorney (1989-'93). He's also lost his law license for eight years (and regained it in April), been caught up in scandals, moved to Australia for a time, returned to Richmond and in 2007 won a seat in the House of Delegates. Like him or dislike him, love him or hate him, Morrissey knows a lot about power — how to negotiate, how to win allies and pressure opponents, and most of all how to survive just about anything and come out ahead. Style: How do you define power? Morrissey: Power is that quality for a man or a woman to effectuate change. And hopefully that change is something that's good. How do see your own power? Do I think I have it? I've never thought that I have power. I do think that I have an ability to persuade. And I use certain tools when I'm trying to persuade people. That persuasive ability can exert itself in committee meetings or in a subcommittee or on the floor of the House of Delegates or in a courtroom. That's my definition of power. I don't say that I have it; I do think I have an ability to marshal a strong argument — a coherent, logical argument that can persuade people one way or the other. Can you think of an example where you've seen power abused? What happened? You tend to see it when people get into a position where they are at the top of the food chain — it can be in politics or it can be in corporate offices — and they forget who they're representing, whether it's shareholders or whether it's constituents. ... We've seen people in elected office that maybe have been there so long that they think they're all-powerful. They think they're omnipotent, and there's a huge fall. In my own world, I've seen the highs and lows of politics. I absolutely know, with 100-percent certainty, that when I leave, I am forgotten. And so therefore you might as well do something that's purposeful and productive while you're here. The thing is, most people don't see that while they're here [in the House of Delegates] right now because they're only seeing the high of politics. They haven't seen the low. There's not too many people that get second chances in politics. ... I am very, very much aware — I am so fully aware — that it will come to an end, voluntarily or involuntarily. And when it does, no one will remember you.